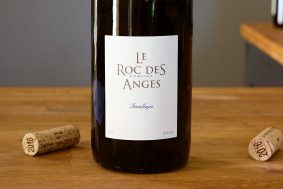 Roc des Anges is not the kind of domaine you expect to find in the Roussillon. 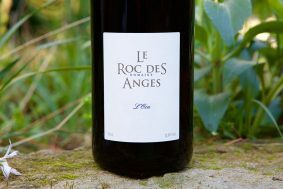 Marjorie and Stéphane Gallet, both transplants from other parts of France (Côte Rotie and Normandy, respectively), have constructed a biodynamic wine sanctuary in the Vallée de l’Agly, a nearly deserted vineyard land dominated by co-ops and famous for producing fortified wines. The locals continue to abandon vines every year because the yields are tragically low and make it one of the most difficult places in France to make a living in vineyards. 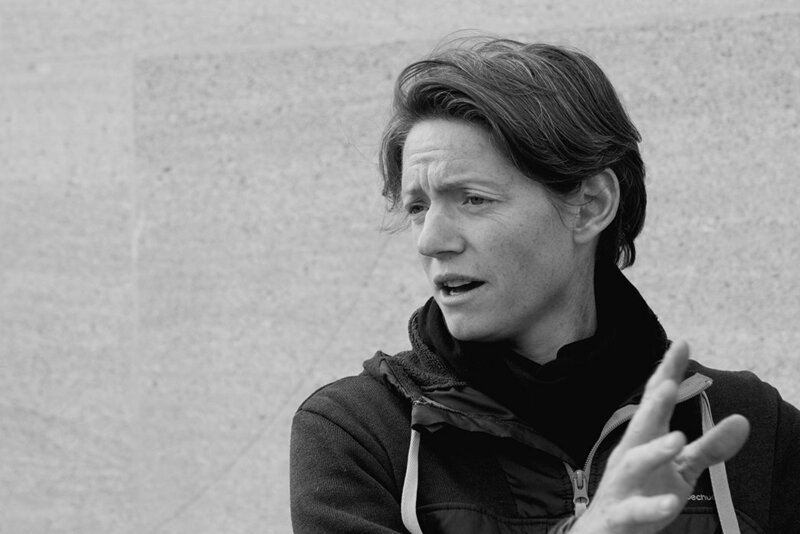 Since she began the project in 2001 (at age 23), Marjorie’s intuitive and peaceful contemplation have resulted in wines that carry a signature of purity, focus and elegance unlike anything made in the region. 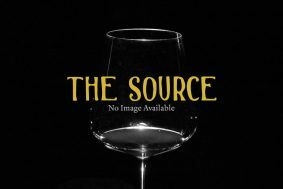 They are low alcohol, hands-off, mind-on wines bottled by varietal from single sites on specific and unique soil compositions. 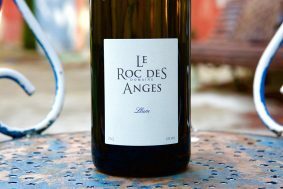 In smell and taste, their structure and style more closely resemble that of their earthy and salty cousins from the middle of France’s Loire Valley. 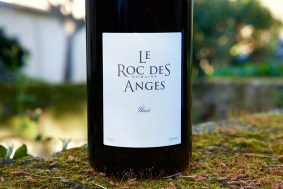 Roc des Anges’s range offers a rare view into many southern French grapes (Carignan, Mourvedre, Syrah, Grenache) grown on particular soil types that are bottled as single varietal/site wines. 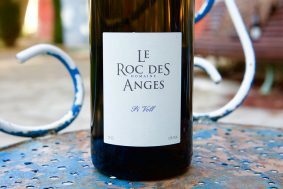 All fermented naturally, their white wines (Macabeu, Grenache Gris and Grenache Blanc) are aromatically strong in earth and mineral tones and are high-energy vertical beams of electricity on the palate—the bulk of them have a finishing pH near 3.00, like many Champagnes! 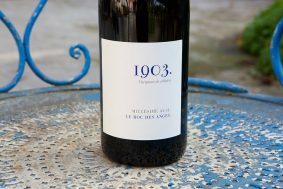 The deep and character filled reds speak with a clear voice of their terroir and varietal. 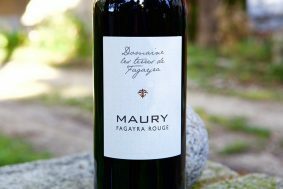 They also make fortified wines from the AOC Maury that possess the high-toned energy of their range. The winery is a large, modern, minimalist structure of massive limestone blocks crane-set into place, sitting low enough that it blends into the arid landscape. Natural light floods a ground floor where square concrete fermentation tanks line one wall. Giant vineyard rocks scattered about are used to hold down the wooden structures that submerge the layer cake of destemmed, uncrushed and whole cluster red grapes (30%) during fermentation. Marjorie works in the cellar alone so she can stay connected to her wines. Just under the first floor is her barrel-filled, underground wine chamber, which she has given the full feng shui treatment. It’s down there where she slowly chips away any unnecessary weight from her wines and transforms them into fine architectural sculptures. 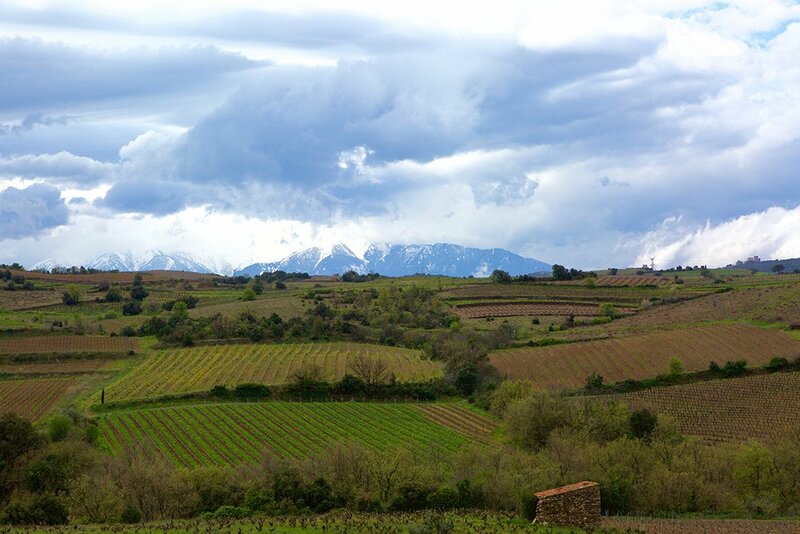 France’s Roussillon is the last wine department before entering Spain on the Mediterranean Sea. Much of the vineyard land is within sight of the water, fully exposed to the sun and on perhaps the most arid land in France. The geology of the region is complex and diverse due to the Pyrenees, a three hundred mile long mountain chain uplifted by a tectonic collision between the Iberian and Eurasian plates. The highlands of the mountains are largely made of granite, while many of the lower areas, like vineyards, are heavy in schist and limestone mother rocks. Despite largely being to the west of their vineyards, locals refer to the Pyrenees range as their “magnetic north” because of its strong influence. 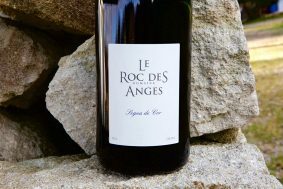 Roc des Anges’s biodynamically farmed (since 2011) vineyards sit in one of the lowest yielding areas of the Roussillon in the Vallée de l’Agly, a north-facing amphitheater closer to the mountains than the sea and between the villages, Latour-de-France and Cassagne. Cool air from the mountains rushes in at night, creating an extreme diurnal shift, which contributes to the development of complexity in the grapes. Margorie said that the nighttime cold also makes it almost impossible to have a dinner outside, even during the summer. 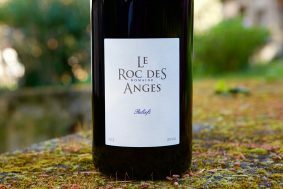 The sun, the intense winds and the nutrient-spare but character filled soils (mostly schist) all contribute to the concentrating of the grapes and their resulting wines. She added: “The enemy here is concentration.” The resulting minuscule yields too easily lead to unnecessarily dense wines—the opposite of her objective. When Marjorie and Stéphane fell in love with the area, they didn’t consider the yield of the vines. The natural concentration and the wild weather (there are many hailstorms and frosts), forced them to purchase a lot more vineyard land than expected, so they have over forty different sites, with a total of around fifty hectares. The majority of the vineyards are on moderately steep slopes or wide-terraced plots of schist soils with varying degrees of sand, silt and clay topsoils, largely decomposed from the bedrock. Most have full exposure on all sides, while others are set further back into the mountains (like Imalaya, their top white) where the granite soils are found. A tour of their vineyards reveals their attention to detail and the quality of their work. They are in touch with nature through practicing organic and biodynamic farming, and the observation of nature’s rhythms. These practices are central to their philosophy and necessary in order to craft wines as singular and unique as theirs are. 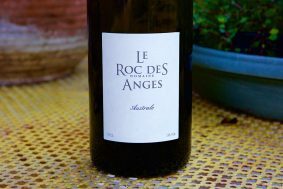 Marjorie explained, “If wines are farmed chemically, the raw material is not alive enough to be sensitive and receptive to all the energy around them, positive and negative.” Which, of course, sums up vin de terroir perfectly.